Current Promotion is valid till 30 June 2019. Painting must be completed by 30 September 2019. Free Mayer Juicer is only applicable upon completion of payment and survey. Colour is subjected to availability. Free Warranty is only applicable to homes painted with recommended system. Payments can only be made in cash, cheque and/or by Visa or MasterCard credit card issued in Singapore. 0% Interest Free 12-month installment is only applicable to POSB/DBS Credit Card holders; minimum spending of $500 is required. Free Upgrade to Weatherbond Algaeguard is only applicable to landed property exterior painting. Value Package comes with 2 coat of top coat for walls. (1 colour only). All painting packages come with Matex (white) for ceiling height not exceeding 2.6m. All painting packages do not come with sealer painting. Separate charges will apply for additional colour(s) added. Top up is required should the house size exceeds 1400 sq ft.
All Interior painting packages come with Matex (white) for ceiling height not exceeding 2.6m. All Interior packages do not come with sealer painting. Erection of scaffolding works or any height access equipment access equipment will be charged separately. Instalment plan is not applicable for landed property painting. Terms and Conditions apply for all painting packages and services. 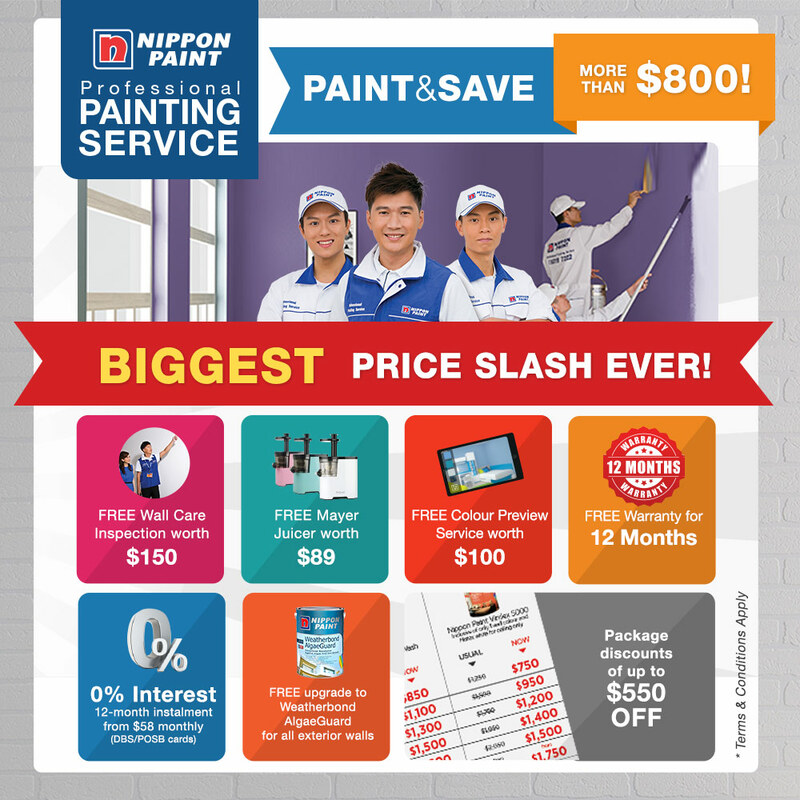 All information is correct at the time of printing, Nippon Paint Singapore Co. Pte Ltd reserves the right to withdraw and/or amend the terms and conditions of the promotions without prior notice.